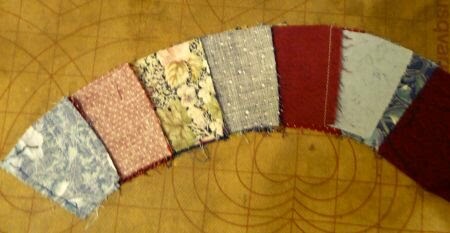 This is my Double Wedding Ring (DWR) Quilt – or what I’ve got done so far. In September 1989 I signed up to take a Double Wedding Ring quilt class. I had previously made my first quilt in 1980 and I had been sewing for nearly 15 years, so I figured I could make this quilt with proper instruction. The quilt was originally to be finished for our 5th wedding anniversary, which was 14 months away. I thought this was extremely do-able, although the ladies at the quilt shop had doubts since I didn’t have much had next to no quilting experience. We used Mary Ellen Ingle Hopkins’ book The Double Wedding Ring Book. I had no experience picking out multiple fabrics for a quilt. I knew I wanted blue and burgundy. The ladies at the shop had to guide me toward texture, print size and color value. The class met at least twice, maybe more — at this point I can’t remember. I do remember an experienced quilter, who had made a DWR, taking the class. She said she was taking the class to ‘force’ her to get the quilt underway. It seems it was to be a wedding gift and the wedding was just two or three weeks away! Anyway, I enjoyed the class. By the end of the class I had two rows sewn together. I continued to work on the quilt after the class was over for a while. However, life got in the way of completing it. We moved the following summer and the quilt got packed up. It was not finished for our 5th anniversary. We moved a couple of more times and I would pull it out and work on it for a bit. My next goal was to finish it for our 10th anniversary, then 15th, and 20th. Well, it’s still not finished. I really want to finish this quilt for our 25th anniversary — 15 months from now. Again I think this is do-able — probably more so now than it was then. To that goal my intermediate goal is to get the top done by mid-October so I can put it on the quilting frame. Yes, I want to hand quilt this top. So I’ve got to get piecing. Here’s my most recent problem. A combination of bad cutting and seam allowances. The arc on the bottom was cut out with scissors. The one on the top is an arc I ripped apart and re-cut using a rotary cutter and the templates my friend’s husband made me. That’s nearly 3/4 of an inch difference at the top of the arc. No wonder the newly cut pieces weren’t going together well. I’ve checked and the new arc is the right length, so I think I’m on the right path. I’ll post my progress. Perhaps this time I won’t get distracted.